“Regardless of political persuasions, the economic environment, or the latest weather conditions; Sports Unite Us! Whether you are a Fan or an Athlete, the passion for sports is Contagious and Inspiring… With an emphasis on programs to reach Youth, Master’s (Senior Citizens), and the Physically Challenged, the Empire State Sports Council is prepared to meet the needs of all Athletes of any age, gender, or skill level. Besides providing anexcellent value to each of these folks, the Empire State Sports Council is determined to create an unparalleled sporting experience that fosters good sportsmanship, honest competition, and healthy habits for each participant…”! This is just an excerpt taken from the ES Sports Mission Statement, and was realized at the Adirondack District Championships! The winning Team at the Adirondack District Championships was Country Mills Eagles, but this year a NEW group of Athletes took part, and that was the Parents of many of the Youth Athletes, which provided a clear example of how sports can be a Family Affair. It is sort of an opportunity to pass the “Torch”, or in this case the “Baton” from one generation to the next, and at the same time score points. 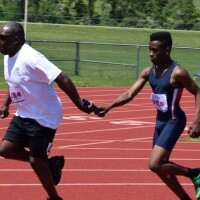 Pictured above is Orville Ivey Jr. passing off to his Dad, Orville Ivey Sr., as Dad took the blind exchange almost flawlessly to anchor the Country Mills Eagle’s Open Men’s 4x100m Relay Team. Liberty Sports Gear has partnered with the Empire State Sports Council (ES Sports) and is offering more than $1,000 in Gift Certificates, that can be used by the winning clubs for Equipment, Footwear, Team Uniforms, and more! The Liberty Tour Track & Field Series is comprised of six (6) events, and the Independence Invitational is next up on Friday, July 3rd, with a 4:00 pm start time. Be sure your Track & Field club makes it to both remaining Liberty Tour event, so that your Team is in the best position to earn one (1) of four (4) Team Prizes. 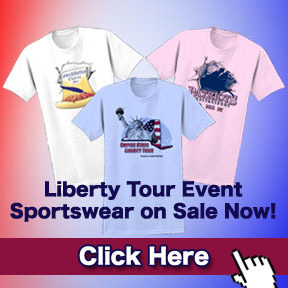 The top Prize is worth $500 of Liberty Sports Gear! Below, we captured some of the other Country Mills Eagles Families that competed together to assist the Eagles in their first win of the 2015 Liberty Tour Track & Field Series. We hope you enjoy them, as much as we enjoyed being a part of the FUN and EXCITMENT on what was a beautiful day for Track & Field! Just scroll down further to view the Thumbnails. Click the Thumbnail to view the entire photo with the caption. For all of the Results from the 2015 Adirondack District Championships, just click “Results” from the navigation bar for the Liberty Tour. We look forward to seeing everyone at the Independence Invitational at CBA (Christian Brothers Academy), for which many have already registered, on Friday, July 3rd! Mama Eagle, Latasha Murdaugh (Country Mills Eagles) took 1st Place in the Master’s Women (35-39) 200m dash with a time of 47.28. She is a single Mom with four (4) daughters, all of whom are Eagles! 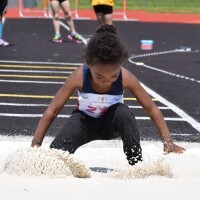 The youngest of her children, Uriah, has a safe landing in the Long Jump, after taking 1st Place with a stunning leap of 1.48m, which is impressive for a four (4) year old! Getting quite a bit of air under her feet, Unity Murdaugh jumps 1.38m. 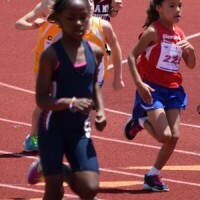 She also competed in the 100m and 200m dash. Earning 3rd Place in the Bantam Girl’s 100m dash was Uniah Murdaugh with a time of 21.32 seconds. Making a comeback, Laura Kamara isn’t afraid to show her little girl, Leona, how it’s done on the Track, as she clocks a time of 3:42.97 in this 800m Run to take 1st Place in the Open Women’s division. With little interest in running 800m, Leona showcases her talent in the Sprints as she takes 3rd Place in the Sub Bantam Girl’s 100m dash! 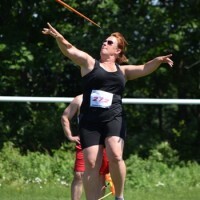 Mom showed the “boys” that she can score points too, as she threw the Javelin for the first time in her life at the Adirondack Championships, and had NO problem taking 1st Place in the Master’s Women (35-39) division with this toss of 18.80m. Jack of ALL trades, but Master of none, Ezequiel took 1st Place in the Midget Boy’s Pentathlon scoring 477 points. 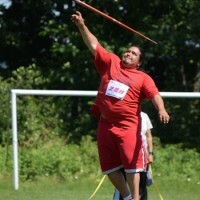 Dad (Fausto Gomez) holds his own in the Master’s Men (40-44) division throwing the Javelin 18.12m, which earned 2nd Place! Bryana Gomez took 3rd Place in the Midget Girl’s 100m dash with a time of 22.06. Arianna Mills (alias the Jumpin’ Bean) takes 2nd Place in the Long Jump, behind Teammate Uriah Murdaugh, with a leap of .91m! 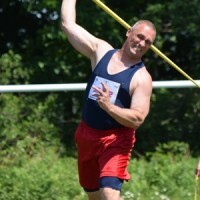 The “CLERK” “Put” in overtime at the Adirondack Championships, and managed to earn 1st Place in the Master’s Women (50-54) division with a heave of 5.92m! With a near perfect exchange, Orville Jr. passes the baton to Orville Sr. helping the Country Mills Eagles take 1st Place in the Open Men’s division 4x100m Relay. Samantha Ivey takes 1st Place in the Youth Girl’s Shot Put with an impressive toss of 5.69m.